Browse: Home /	Composting, Events, ZERO WASTE / Leaf Composting this Sunday November 8th! Sustainable Flatbush is proud to be part of Project LeafDrop: “a volunteer-run, neighborhood-based coalition of gardeners and greening partners who are harvesting residential leaves for compost this fall.” The Flatbush CommUNITY Garden, a project of our Urban Gardens and Farms Initiative, will hold leaf collections on Sunday November 8th and Saturday November 21st from 11am til 1pm, and there will be a shredder on hand to create leaf mulch “while you wait.” So bring your fall leaves to 1550 Albemarle Road (at Buckingham Road) and be part of the movement for less garbage and more gardens! Until 2007, the NYC Department of Sanitation collected leaves in the fall and brought them to a municipal composting site in Staten Island; this compost was made available to urban gardeners at pickup sites throughout the city in the spring. However, in 2008 the Department of Sanitation discontinued this program and New York City’s leaves were carted to landfills along with the rest of our garbage, where they represent both a major addition (20,000 TONS) to the city’s waste management burden and a missed opportunity to create free, high-quality gardening fertilizer for NYC residents and community gardens. Last fall one pioneering Brooklyn community garden, the 6/15 Garden in Park Slope, conducted its own leaf collection and was overwhelmed with leaves from literally all over the borough (apparently some were even brought by subway!). Several weeks ago Sustainable Flatbush participated in the brainstorming meeting that created Project LeafDrop. With 6/15’s experience to draw from, representatives from Brooklyn Botanic Garden, Brooklyn Compost Project, Earth Matter, East New York Farms, and several community gardens created a blueprint for how to collect and compost leaves locally all over the city. More information about the project and leaf collection locations is available at the coalition’s website NYCLeaves, and also at the blog of our own Flatbush Gardener, where he includes a map of all the sites in Brooklyn. The leaves will be composted at community gardens for use onsite. 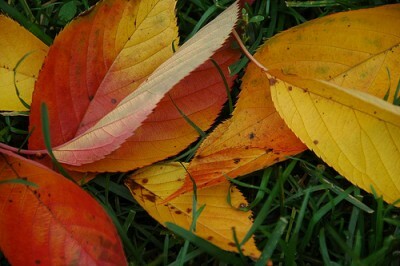 Many folks have had bad experiences composting leaves, but leaves make wonderful compost. Leaves are full of nutrients picked up by the root system of the tree. The secret to easy leaf composting is making sure the leaves are shredded. Also, it is important to have a nitrogen source (such as grass clippings) in your leaf compost pile. Other sources of nitrogen include manure, dried blood, alfalfa meal, and bone meal. If you are using manure, use 1 part manure to five parts leaves. If you are using a natural source of nitrogen such as dried blood, use two cups per wheelbarrow load of leaves. Hopefully you will look at your leaves differently from now on!